AFC Fylde new boy Jordan Tunnicliffe was delighted to get off the mark during the Coasters’ 2-1 victory over Morecambe earlier in the week. 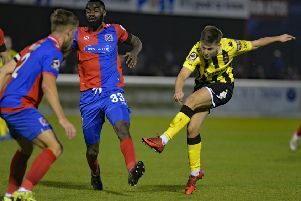 The defender, signed from Kidderminster Harriers over the summer, netted the second goal after Danny Rowe rounded off a fine team move to open the scoring. Tunnicliffe looks set to start the new season alongside club captain Josh Langley at the heart of defence after some impressive displays during Fylde’s friendlies. Tunnicliffe said: “We were really pleased to get a positive result against a Football League side. We set out to win every game in pre-season and a lot of the lads got 90 minutes too which was the most important thing. “The main goal in pre-season is to be ready for that first game of the season and I think we are. Pre-season is nearly over now and we are raring to go for the season. “It’s been good playing with Josh so far. We have been communicating well and we have worked hard on forming a partnership in training. The Coasters travel to Curzon Ashton this afternoon for their final pre-season outing before kicking off their National League season the following Saturday against Boreham Wood at Mill Farm. Dave Challinor’s players then travel to Chester three days later for their first away game. The Coasters host their eagerly-anticipated kit launch on Tuesday at the Mill Farm club shop. Players will be on hand to serve customers, while posing for photographs and signing autographs for fans.